Morning has come and the storm has passed as Daniel and his friends wake up from their sleepover. Looking out the window, they find that there are many tree branches and leaves on the ground. As they eat breakfast, Mom Tiger explains that after a storm, the plan includes heping your family, helping your neighbors, and then helping your neighborhood. Stepping outside, the Tigers quickly repair their mailbox which was blown to the ground by the storm. King Friday stops by to ask for help at the clock tower. On the way, they find others to be safe and cleaning up their own areas of the Neighborhood. At the clock factory, everyone sees that a tree has fallen in front of the clock factory. Dad Tiger eases Daniel's nervousness by encouraging him to "look for the helpers" in scary situations. Daniel feels better as he watches Neighborhood firefighters -- Music Man Stan and Doctor Anna -- remove the tree with Trolley's assistance. Daniel make-believes that he is a helper, keeping everyone safe in the whole Neighborhood. Mr. McFeely arrives with a new tree to be planted. King Friday asks Daniel to help put it into the ground as everyone recognizes how they all worked together after the storm. "Take a grown-up's hand, follow the plan, and you'll be safe." The live action segment following this episode includes a boy helping to clean up a playground in his neighborhood. 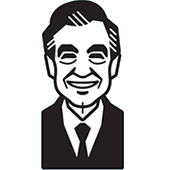 The idea of looking for the helpers is based on a suggestion from Fred Rogers: "My mother would say to me, 'Look for the helpers. You will always find people who are helping.' To this day, especially in times of disaster, I remember my mother's words, and I am always comforted by realizing that there are still so many helpers — so many caring people in this world." The storyline from this episode is featured in the book Look For the Helpers. A short clip from this episode is used during the closing song -- A Neighbor is Here to Help -- of Episode 215b.